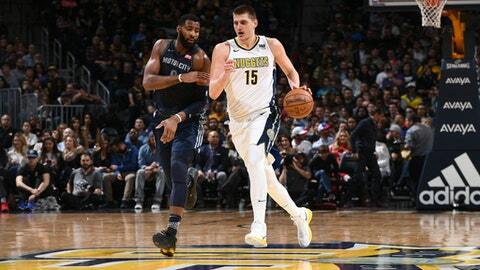 DENVER (AP) Nikola Jokic was cool after his eighth triple-double of the season. With good reason: He was covered in ice packs – one on his right wrist and another on his back, no doubt courtesy of his tussle with big man counterpart Andre Drummond. Then, off to the hot tub. Jokic’s hot hand accounted for 23 points, 12 rebounds and 10 assists, Jamal Murray added 26 points and the Denver Nuggets‘ playoff hopes received a much-needed boost with a 120-113 victory over the Detroit Pistons on Thursday night. ”He had a hell of a game – triple-double and a win, too,” Drummond said of Jokic. Giving up big leads is a trend Denver would like to curb. It’s happened too often for the team’s liking. ”It’s unfortunate we allowed that run to take away what could’ve been an even better win,” Malone said. Denver’s big lead melted away with the Pistons hitting eight 3-pointers in the second half. Detroit cut the deficit to 102-97 with 6:55 remaining. Gary Harris hit a scoop shot and then had a fast-break dunk in which he was fouled. He landed awkwardly on his right leg and after a timeout he hit the free throw. He then left the game. Jokic was a handful for Drummond – and vice versa. Jokic had trouble with Drummond’s strength down low, and Drummond struggled with Jokic’s range as he frequently took Drummond outside. ”I took it to his chest every time and tried to just score,” Drummond said. ”He wasn’t trying to block any shots, he just wanted to stand there and get a bailout foul and get back on offense. Pistons: G Reggie Bullock returned to score 17 points after missing a game with a sore back. … It was Drummond’s 51st double-double of the season. … Detroit’s last road victory was Jan. 10 at Brooklyn. Nuggets: F Paul Millsap added 14 points. … NBA Commissioner Adam Silver was in attendance. … The Nuggets improve to 27-10 at the Pepsi Center. Jokic’s eight triple-doubles are the most by a Nuggets player in a season since Fat Lever had nine in 1988-89. This one almost seemed, well, quiet.